One in a series of posts analyzing urban environments in the United States and around the world. This is the first of two posts about the French town of Neuilly-sur-Seine which lies west of Paris between the Arc de Triomphe and the Grande Arche at La Defense. In our last post in the Planning Cities Smartly series, I presented a block along Rue de Bac in the Seventh Arrondisement. That block was more urban, more heavily trafficked, than the blocks which are the subject of this post and another which will follow. I often refer to Neuilly-sur-Seine as the “Brookline” (MA) of Paris, a close-in urban suburb, but Neuilly has both a greater density and a quieter feel that Brookline. The latter is due mostly to the particularly French tradition of hidden gardens and courtyards. Behind the street-front walls of these blocks, beyond the old carriage doors, lies and assemblage of residential/office mixed uses around landscaped courtyards. These hidden buildings and their courtyards soften the urban context that is apparent from the street. The blocks shown in this post lie on either side of Rue Madeleine Michelis. The street is lined with stores, bakeries and a butcher shop along its length. It is anchored at its southern end by a square that comes to life each Wednesday, Friday and Sunday with a food and merchandise market. The rest of the week it quiets down only slightly as it remains a lively space ringed with restaurants and bistros and a college classroom and administration building. The streetscape along Madeleine Michelis is particularly interesting in that it is very pedestrian without banning vehicular traffic. It has a one-way single lane with limited parking along each side. The street trees are magnolias, an interesting and very successful cloice, and there are a series of well-maintained planters spaces between the trees. In the accompanying photos you will see the landscape of Madeleine Michelis and the excitement of the market as well as an iconic carriage door that conceals the entrance to one of the courtyards. As you look at the birds-eye photo and the pencil sketch, notice the varies texture of the rooftops and building facades. Notice also how intimate the garden spaces are. These are not Place des Vosges scale spaces, they are far more snug and personal. The feel that you get in Neuilly-sur-Seine, especially in these precincts, is of an urban excitement and range of possibilities with the always present opportunity to retreat into privacy. On a very different scale, I get some of that same community/privacy feeling in the Old Town section of Marblehead, Massachusetts. That similarity of sense in two very different environments is intriguing and I will visit this idea again. We hope that you enjoy these posts. You can sign up to receive new posts as they are released. One in a series of posts analyzing hosing development in the United States and around the world. As a first year architecture student, I was subjected to the same inane kindergarten exercises imposed on most, if not all, of my kin. One of these was represented as a study in composition. We were told to take two sheets of contrasting, colored construction paper, one quite large and the other a fraction of its size. The object was to move the smaller piece around on the larger observing and noting the apparent effect of each variation. Like my fellow students, I was appalled and annoyed. Twenty years later, I used those exercises in creating the site design for Dolan Green. 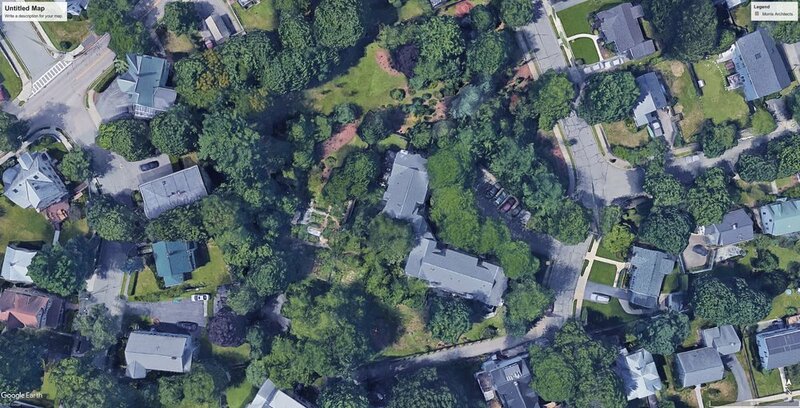 By placing a cluster of townhouses on one corner of the site, as close to the two adjacent property lines as local zoning would allow, I greatly enlarged the apparent size of the remaining site. I used that enlarged open area to create a “woods” now populated with towering forty year-old trees. The effect has been to create a natural wooded area where previously there had only been a barren, tree-less schoolyard. Three of the townhouse owners have decided to used their allotted exclusive use areas to create landscaped courtyards. One of those owners, your Humble Correspondent, created a space that allows a variety of gathering areas suitable for a private client lunch meeting or a larger gathering. Note the photographs shown here. 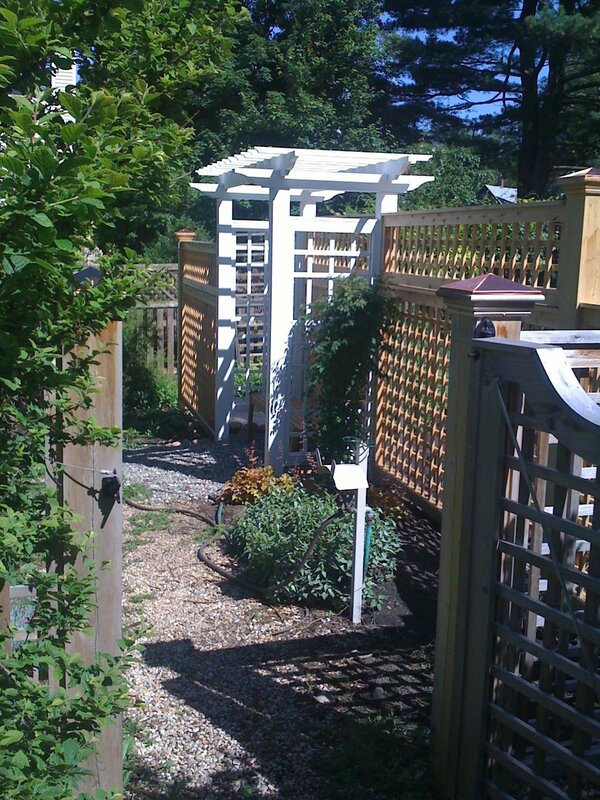 In addition to the exclusive use areas which are adjacent to each unit, each owner is assigned a garden plot. Being the developer and architect as well as an owner, my plot was designated on the condominium documents as the largest of those plots. 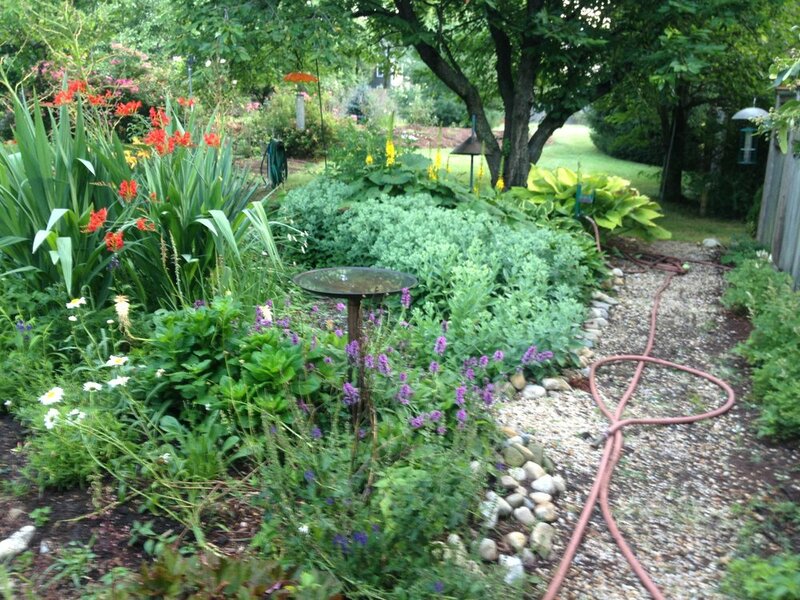 The result is a sizable vegetable and perennial garden replete with a bean arbor and a garden shed. Inevitably someone, often a new unit owner, asks whether we can/should/would build more units in the woods. Defending those woods has become one of my unanticipated responsibilities. Although the original special permit that allowed the site’s development limited the number of units to seven, I fear that a future city board might be tempted to allow denser development, especially given that the neighboring homes have no woods..
Good design, like good intentions, are subject to editing by future forces unaware, or uncaring, of the original intent. Ending on a happy note, two sub-committees of the Newton Comprehensive Plan Commission (Housing and Environment), used Dolan Green as an example of good design in their reports. Thank you. One in a series of posts analyzing urban environments in the United States and around the world. It is hard to think of Paris without thinking of its public gardens, squares and tree-lined streets. From the massive Luxembourg Gardens to Place de Vosges to the Tuileries, Paris is very publicly green. This was not always the case. It took the audacious Georges-Eugene Haussman and his patron, Napoleon III, to expand Paris green-spaces from a paltry 47 acres to more than 4500 acres. 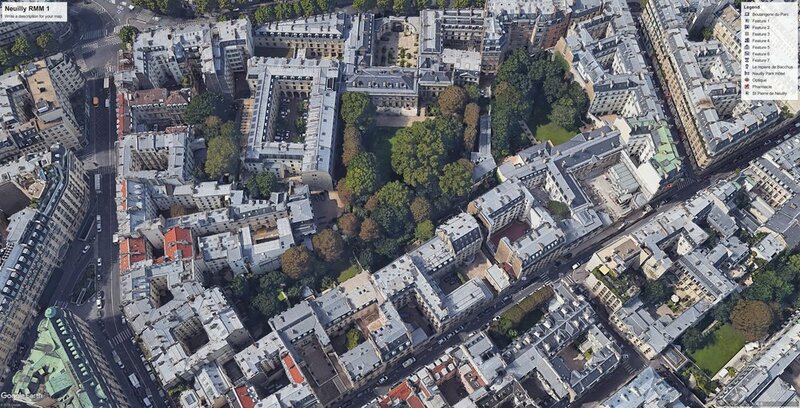 As impressive as that growth is green-space is, it may be the fervor for gardening and greenery that Haussman’s work generated that spawned what was to become Paris’ other urban planning signature: the thousands of hidden gardens that lie behind the street-front facades of commercial and residential blocks. This post looks at one of those blocks, bounded by Boulevard Saint-Germain, Rue de Bac and Rue de l’Université, near the d’Orsay Museum. 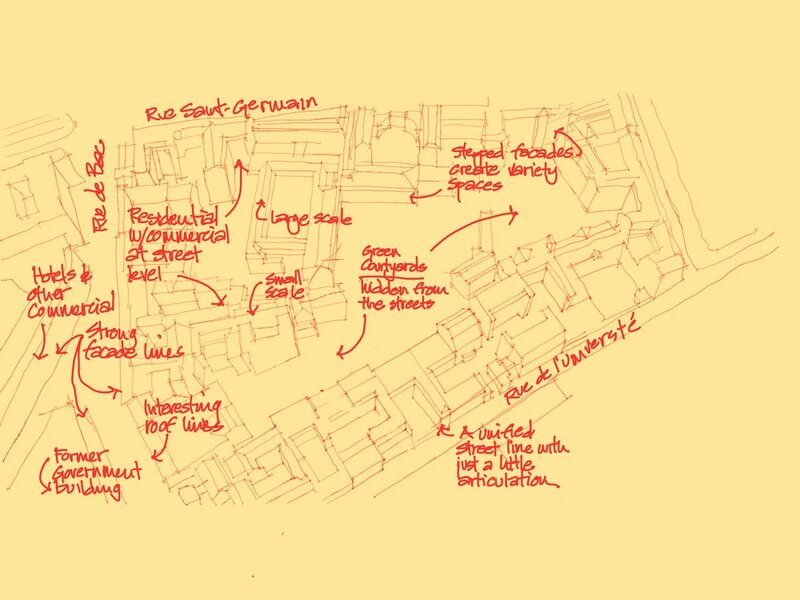 Here I show a birds-eye view of the block adjacent to a sketch that illustrates the features that define it. Note that this is a mixed-use block with offices and street-front retail, bistros and galleries. Residences are mostly on the upper levels. This robust mixture of uses is another signature element of Paris city planning and it adds immeasurably to Paris’ energy. In his novel, Paris in the Present Tense, author Mark Helprin wrote "There are many hidden courtyards in France. It might be said that the whole country and its culture is a form of architecture that protects private life. Almost all of its large buildings surround an interior garden as delicate as the stone walls around it are strong." Paris loves that combination of mixed use energy softened by hidden gardens of tranquility.